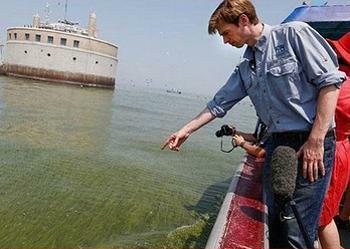 TOLEDO, Ohio, August 3, 2014 (ENS) – More than 400,000 residents of Toledo, Ohio’s fourth largest city, are without water following the detection of the toxin Microcystin in the public water system, caused by an algal bloom in the area. On Saturday, Governor John Kasich, a Republican, declared a state of emergency for Lucas County, where Toledo is located, and neighboring Wood and Fulton counties. 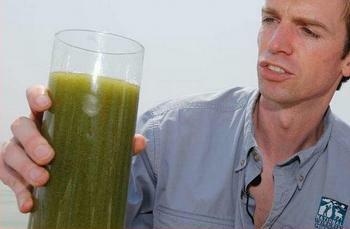 National Wildlife Federation President Collin O’Mara points to toxic algae in Toledo’s Maumee Bay, August 3, 2014 (Photo courtesy NWF). This declaration allows state government to maximize the use of its resources to support local authorities in addressing this situation. The state Emergency Operation Center was activated Saturday. State and local officials are working together to arrange for drinking water to be shipped into the affected areas. Eleven water distribution sites at fire departments and schools are open today, the second day of the emergency, but residents must bring their own containers to most of them. To date, 33,000 gallons of potable water have been produced by the Ohio National Guard, and 15,000 additional gallons in collapsible containers have been distributed along with 9,000 cases of water. Additional deliveries are arriving on a regular basis. The American Red Cross of Northwest Ohio is activating volunteers to assist with bulk distribution of water. Water at retail stores has been restocked. Restaurants are closed unless they can use bottled water for cooking, all food preparation and dishwashing. Microcystin is a product of blue-green algae and is naturally found in Ohio lakes, ponds and slow-moving streams. The algae feed on chemical fertilizers and manure from crops and livestock operations entering waterways. Scientists caution that these conditions, plus record-high summer temperatures, contribute to the spread of toxic algae. Officials are advising residents not to drink the water. Health effects could include numbness and dizziness, nausea, vomiting, abnormal liver function, skin irritation or rashes. Do not boil the water, as boiling will not destroy the toxin, officials warned. Alternative water should be used for drinking, making infant formula, making ice, brushing teeth and preparing food. Do not let children bath in the water, the advisory states, although hand washing is allowed and showering is allowed for adults. Residents are advised to contact a veterinarian immediately if pets or livestock show illness. Today the National Wildlife Federation led a boat tour for journalists and officials to view the algal bloom at the center of the Toledo water crisis. National Wildlife Federation CEO Collin O’Mara and Frank Szollosi, Toledo resident and NWF manager of regional campaigns, led the tour.